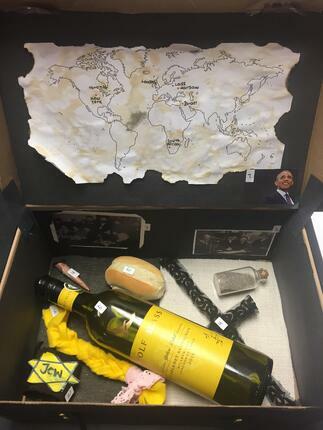 In March of 2017 I helped Michael Pitblado publish a blog called “Going Beyond Anne Frank: An Arts Integrated Approach to Explore Victim Experiences During the Holocaust.” Michael explained the project in the following way; “Using a suitcase motif—ubiquitous in Holocaust iconography—I challenged my students to create an art installation at the Studio Art Gallery at Queen’s University based on their understanding of diaries written by seven tweens and teens during the Holocaust.” Ever since I read this post, I have wanted to use this project in my classroom. This year I was given the opportunity to teach CHT 301; Open level Global History from 1900-Present. This course provides a lot of flexibility for course content due to the time span, and the fact that it is Global history. This was the perfect course to finally try Michael's project in my own classroom. One of the guiding questions my class has been focusing on this year is “how is history relevant to our present?” With the increasing neo-Nazi activity and protests, continued antisemitism, and at the time approaching Holocaust education week, I saw this as a great opportunity to demonstrate to students the relevancy of history. Then during our studies of the Holocaust the massacre in Pittsburgh took place, as well as Justin Trudeau’s apology for the MS. St Louis and commitment to a new refugee policy. 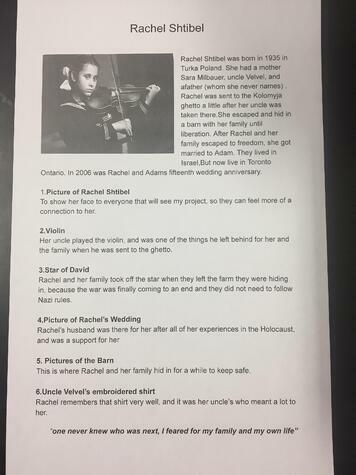 Students were following these events in the news and feeling even more connected and passionate about our study of the Holocaust. As this is an open level course, I have a wide variety of academic abilities in the class. An entry from Salvaged Pages (the testimony source used by Michael) was too lengthy and difficult for my students to tackle reading. I decided to use the Azrieli Foundation Holocaust Memoirs Program re:Collections site. If you have never been on the website, I highly advise you to take a look around. 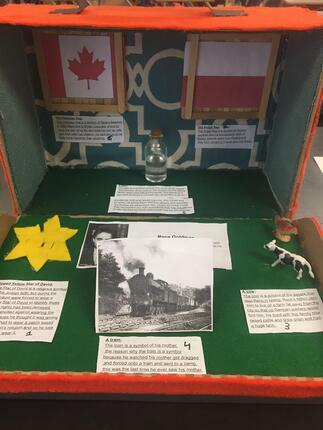 In re:Collections, they have recorded testimony from Holocaust survivors living in Canada, excerpts from their written testimonies, as well as pictures. With the variety of information and the different mediums it is presented in, it was a perfect way for my students to research. I provided students with a carefully scaffolded booklet to guide their research. This included creating an identity chart for their survivor. 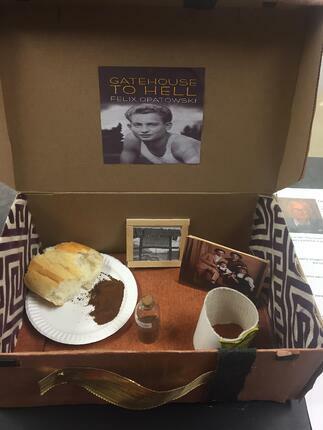 Out of their research, students had to create a museum style wall panel that would accompany a suitcase exhibit. I created a full exemplar which proved extremely useful as students used it to model their work after. 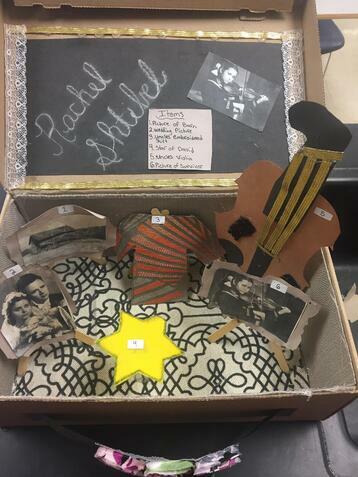 With funding from my history department, I provided each student or pair of students with a blank shoe box which they decorated like a vintage suitcase. This class has never been more focused. I sourced all of the decorating materials and students had to create or source all of their objects. This group was so thoughtful. I had one student comment about her survivor, “I feel like I know him. 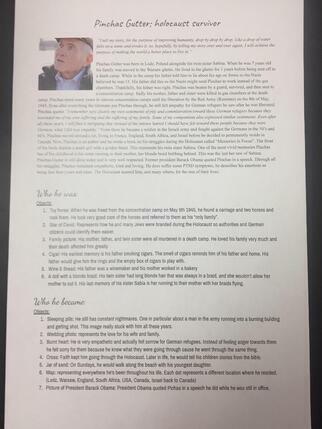 I really care for him and I’m so happy he lived.” It was amazing to see what parts of the stories the students identified with. You could really see their own identities playing into how they related to their survivor. I will absolutely be trying this project again. I also have more project and lesson ideas that I look forward to incorporating into my teaching thanks to the inspiring work of so many Facing History Educator bloggers. What are some project or lesson inspirations that you have gotten from the Facing Canada blog that you have been able to use or adapt to your classroom?